Set of three superb Ming Dynasty tomb pottery attendants! The figures holds a vessel, saddlebags and a what we think is a sort of vessel(?). A fine Sino-Tibetan gilt bronze figure of a lama, modelled seated in rajalilasana, his robes engraves with floral motifs, on engraved base, Qing Dynasty 1644-1911 AD. A beautiful bronze, finely engraved and with a particularly fine thick gilt. Size: Near 16 cm. high and weighing ca. 2,5 kilograms, unsealed and with a nice old patina below and inside the base. Scarce Chinese Ming Tomb pottery figure of horseman w Bow! 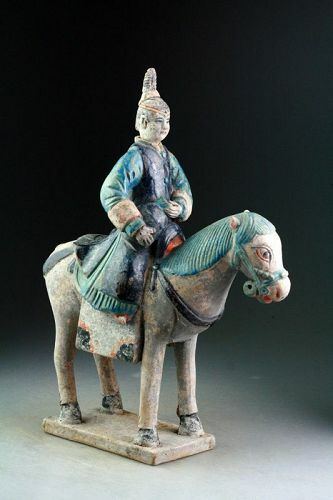 Superb Chinese Tomb Pottery figure of a mounted horseman, Dating to the Ming Dynasty 1368-1644 AD. A large and very impressive tomb pottery horseman, Chinese, 1368-1644 AD. A rare tomb pottery officer that we purchased as part of a small group of less than 10 specimens from the same find, all Horsemen with Mandarin batches and different weapons, and postures. Beautiful Gilt Bronze Sino-Tibetan Buddhist Deity or Guardian! A beautiful gilt bronze figure of a Tibetan Deity or Guardian, likely Late Qing Dynasty. The figure is very expressive with finely cast and engraved detailed and finely gilt, even on the original seal in the base with the Double Varja. Size: 16,3 cm. high and weighing just around 1 kilograms. Rare & large Female pottery rider / attendant w. jar, Chinese Ming! A scarce and large Chinese pottery tomb figure of a female rider / Attendant on horseback holding a jar in her hand. The figure dates to Ming Dynasty, 1368-1644 AD. The figure is finely glazed in cobalt blue and turqoise colors. Pigmented colours in red, white ad black. She has an elaborate high headdress and was made with many finely painted details, high quality. Rare Female pottery rider / Musician on horseback, Chinese Ming! A scarce and beautiful Chinese pottery tomb figure of a female rider / Attendant on horseback holding a string instrument. The figure dates to Ming Dynasty, 1368-1644 AD. This pair come from a very rare group of 'Edged' Tomb pottery figures. The shape of the figures are sort of 'edged' or flat and they are standing on some rather peculiar bases. They are clad in fine glazed robes in cobolt blue and turqoise colours. The male with a high black hat, and the female with an ornate headdress. 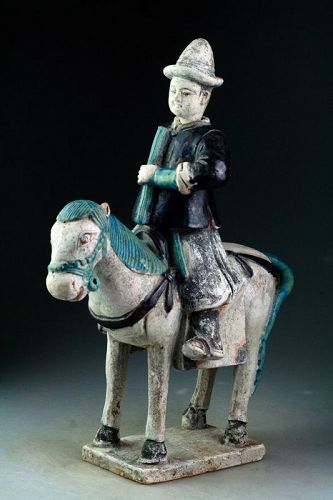 Large and rare Chinese Ming Tomb pottery figure of horseman carrying a sword, dating to the Ming Dynasty 1368-1644 AD. One of a group of very large Ming Dynasty pottery horse riders. The figure is of a military attendant, wearing a hat and carrying a book or a map under his arm. He wears a blue robe with turqoise sleaves. The unglazed areas are covered with white and black pigmented colors. Note that the painting is very detailed and includes wonderful gthick and perfectly rendered facial features. XXL Ming Dynasty tomb female pottery figure, attendant, 64 cm! An xxl superb 64 cm high female attendant carrying a cup or beaker in her hands. The figure is decorated with red, black and white pigmented colors. The glazed areas are held in green and yellow sancai colors. It dates to the Ming Dynasty 1368-1644 AD. 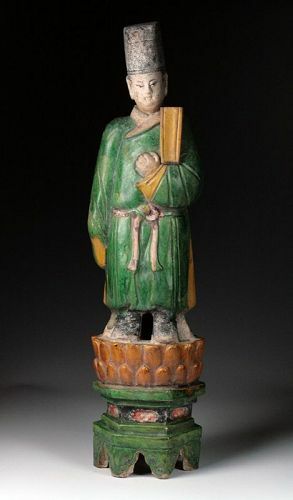 XXL Ming Dynasty tomb male pottery figure, attendant, 64 cm! 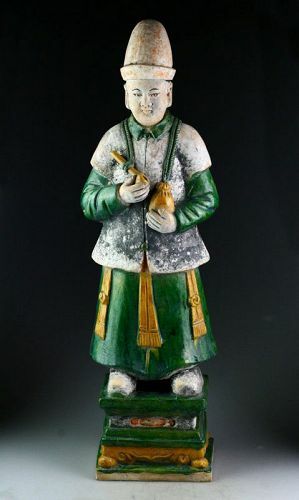 An xxl superb 64 cm high male attendant carrying a teapot in his arms. The figure is decorated with red, black and white pigmented colors. The glazed areas are held in green and yellow sancai colors. It dates to the Ming Dynasty 1368-1644 AD. XXL Ming Dynasty pottery figure lady attendant, 62-63 cm! A superb 62-63 cm. 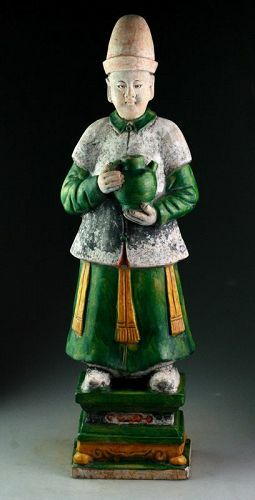 Ming Dynasty pottery figure of a lady attendant holding a tray with a teapot and a cup in front of her chest. Awesome mottled green and yellow glaze. The figure dates to Ming Dynasty 1368-1644 AD. Exceptional pottery figure with fine pigments and glazing. The height and the fact that it's done in realistic life-like proportions makes this figure massive and very heavy. The head was made seperately as always with the largest Ming Tomb figure. 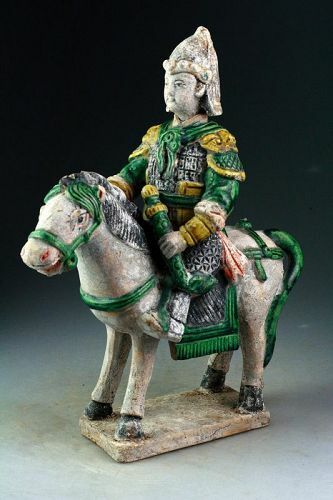 Chinese Ming Dynasty pottery female rider / attendant! 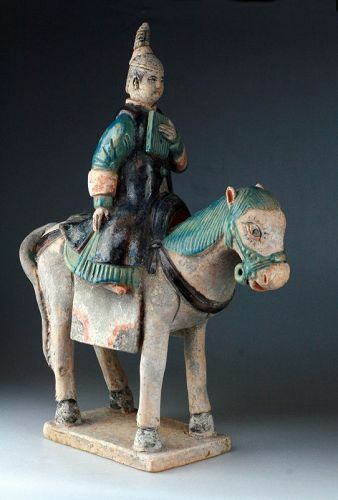 A beautiful Chinese pottery tomb figure of a female rider / Attendant on horseback holding a book or a box. The figure dates to Ming Dynasty, 1368-1644 AD. The figure is finely glazed in cobalt blue and turqoise colors. Pigmented colours in red, white and black. Size: 37,5 cm. high and ca. 28 cm. long - a massive figure! Important & complete set of 12 Ming Dynasty pottery Zodiac figures! Here's a rare & complete set of 12 Ming Dynasty pottery figures each presenting a Zodiac animal from the Chinese kalender cycle. The set consists of 6 figures in dark blue and 6 in turqoise blue, all wearing long gowns with sleeves. All figures are male and wear a headdress in the color of his gown. Pigmented colours in red, black and white. All twelve Zodiacs are represented: rat, ox, tiger, rabbit, dragon, snake, horse, sheep, monkey, rooster, dog, pig. Interesting set of 3 Ming Dynasty pottery attendants. Rare Types! A set of 3 Chinese pottery tomb figures of well-situated Masters attendants dating to Ming Dynasty, 1368-1644 AD. The figures wear different types of clothes and have different attributes, drinking bag, bucket and purse. The colours are beautyful cobolt blue and tourqoise. Pigmented colours in red, white ad black. Size: 22-23 cm in height. Very decorative smaller figures of a type, we haven't met before. An xxl superb 64 cm high male attendant carrying his masters pibe and tobacco pouch. The figure is decorated with red, black and white pigmented colors. The glazed areas are held in green and yellow sancai colors. It dates to the Ming Dynasty 1368-1644 AD.